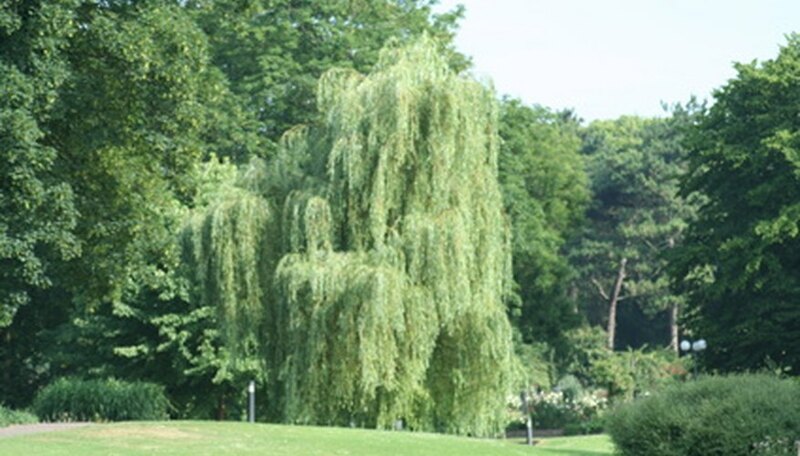 Willow trees are widely considered graceful and refined, because of their open crown of weeping branches. Many willows grow well in moist conditions, making them perfect for areas near water. The type of soil does not make a difference--this species does just fine in clay, loamy, rich, sandy and wet soils. Willows are fast growing, usually reaching heights of 30 to 50 feet tall, with a 35-foot spread. It's possible to transplant willow trees but preferable to do so while the tree is young. Willows have extensive root systems, which can make transplanting a larger tree a nightmare. Transplant willow trees in the dormant period, which is between February and March. This will ensure minimal damage. Choose a new planting site that is in the full sun. It can be in moist or dry conditions, as long as the tree gets the sun it needs. Make sure there are no sewer lines or tanks nearby because the willow's root system is very aggressive and it will cause damage to plumbing. Dig a hole twice as wide and three times as long as the transplanted tree's root system. Because you haven't dug it up yet, you'll have to estimate the spread of roots. A 12 to 15-foot tall willow tree can have a 3- to 4-foot-wide root mass. Make an educated guess on how wide yours will be. Dig around the willow tree as wide as you can, to uproot the tree without damaging the root system too much. Use a shovel, pruning shears and sharp spade. As you dig, if you run into roots, sever them. The tree will grow new roots when it's in its new location. Place the uprooted willow tree in its new hole. Spread out the roots by hand to encourage their growth. Fill the hole in with the removed soil. Make sure to get soil around all the roots, tamping it down to eliminate air pockets. If they remain, the air will dry out the root system. Water the tree thoroughly to help it become established. Give the tree water every two weeks to keep the soil moist.